BurgerTime is a rather unusual game of platform: it's about putting together different food, scattered throughout the levels, in order to make hamburgers. Nothing more simple: to have the elements falling, our little cook just have to walk on them! You can access the various floors through scales, a little like in Donkey Kong. The main difficulty of the game is the enemies constantly harassing you: there's Mr Hot Dog, Mr. Egg, and Mr. Pickles. They will not give you an inch, but know that there are several techniques to get rid of them. The first is the pepper spray you can use by pressing the A button, when they're close: it causes a few seconds of stun. The second technique is to have food falling on them while they're passing on the platform below. Enemies killed this way are temporarily removed (they re-spawn at a specific point). Finally, the most rewarding technique is to wait on a slice and make it fall once they're on it, that is to say just behind you. It's risky, but the utility is triple: not only enemies are destroyed, but food tumbles lower than usual, due to overweight. If you manage to trap two, three or four enemies this way, it falls to the bottom and you receive bonus points! Pepper is the only weapon in the game. At the beginning, you're provided five doses of it, but it is possible to get more with the different items that appear during the game: ice cream, chips, coffee. Each collected object earns points and adds a dose of pepper in the reserve. In general, these bonuses appear when a combo is performed (enemies+food fall) or a certain score is reached. Your pepper is sometimes the only way to get out of tricky situations, so keep it preciously! In addition, the game provides an extra life every 10,000 points. It's not luxury, because BurgerTime is a difficult game. However, the gameplay is incredibly addictive: the labyrinths formed by the levels are challenging puzzles, and you quickly begin to seek for the best way to make combos, but also try to get the maximum score. The more you advance in the levels, the more AI ​​is high... and it's sometimes a pleasure to hurt badly Mr Egg and others, sprinkling them with pepper and see them tumble on our toasts! Data East did a pretty good job, and this can be felt especially with animation. It's not only fast, but it also shows rich with small details, despite the narrow margin of maneuver due to low capacity of 8 bits hardwares. The characters and the food are really cute, many colors are used, but the backgrounds are too simplistic. Too bad, it was probably possible at least to change the colors or some details from one to another. There's a total of six different stages that loop constantly, with a growing difficulty... and this is not bad at all compared to other games of that era. The only downside is for the soundtrack: if the sound effects are excellent, the one and only theme song that's looping leaves irreversible damage to the brain! You got it, that's a bit repetitive. This is a detail that should not prevent you from enjoying this true gem of videogame made by Data East, which is one more pearl of retrogaming. The cookery world drawn here is cute and well made, with nice graphics but repetitive backgrounds. The whole animation is quite decomposed and dynamic, but there's a few slwodowns and blinkings when the screen is loaded with many enemies. Effects are fun and fit well the action, but god... this music... Pleasing at first, the unique theme have you going mad, like the mermaid songs with lost sailors! There's not end to BurgerTime, the limit being fixed quickly with the high difficulty. Anyway, the game is fun and taking and has players coming back soon! The platform concept that inspired Data East is revamped with talent: BurgerTime offer an original and taking gameplay with smart game mechanics. 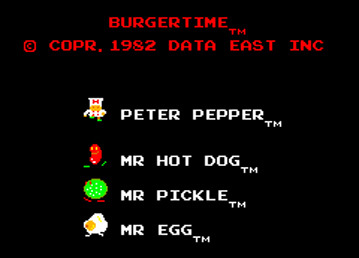 BurgerTime is one great ancestor in the platform game 'Hall of Fame'. We only can think about Nightmare in the Dark, Zupapa! or Bang² Busters in the line of platform games like this one on Neo Geo.